Métropolitain publisher and editor Beryl Wajsman, who is also the founder of The Institute for Public Affairs of Montreal, gave the keynote speech last Thursday to some 1500 participants in McGill's annual Model UN Conference and lost little time sending them a message for a new model for the international system, the bankruptcy of the current one and the moral challenges the future leaders who made up the the audience had a responsibility not to betray. 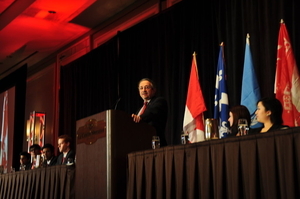 Attendees at the four-day conference at the Sheraton Centre came from over fifty North American universities. 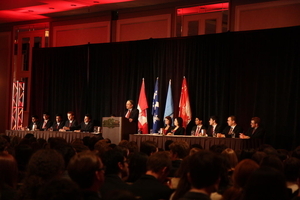 The McGill model UN Conference is held every year, and this year was the biggest such gathering behind only Harvard and Penn State. Harvard and McGill have consistently been the largest over the past decade. Wajsman was in good company. Previous keynoters have included former Prime Minister Joe Clark, former Liberal leader Stephane Dion, Canada’s former ambassador to the United Nations, Paul Heinbecker and Jordanian Princess Badiya Bint El Hassan. Wajsman took less than forty minutes, speaking without a set text, to remind his audience that among its challenges and responsibilities was the duty “…to speak truth to power, stand up for what is right and just and change a UN that has become morally bankrupt and increasingly illegitimate in a desperate world moving toward bi-lateral and multi-lateral arrangements to counter the UN's irrelevancy." After complimenting McMun's organizers for the decorum, efficiency and depth of the gathering, Wajsman then drove home the point that each must now take the next step and become, in Robert Kennedy's words, " part of the thousand centers of energy and daring " to tear down the walls of nullification and resistance put up by the tyrannies that now control the UN and make it such a dangerous influence on the international system. Wajsman’s speech quickly took on the form of a personal conversation which maintained the crowd’s rapt attention right up to the point when he received a standing ovation. After warning his audience not to fall in love with their own sense of moral righteousness and worse- “…your own PR,” he also reminded them that in the beginning, there’s always the word and words do matter. Following a reference to the fact that last Friday was the 67th commemoration of the liberation of Auschwitz and the deportation of Leon Mugesera back to Rwanda because of an alleged hate speech in which his words sparked that country's genocide, he quoted Irwin Cotler-Canada’s former justice minister- that “Holocausts begin with words-not bullets," and Wajsman warned that the words coming out of the UN are dangerous in their "mendacity and demonization." Wajsman described how it took less than a decade after its foundimg before the compromise of the UN’s original mission began as tyrannies gained membership and tyrants began to use their so-called ‘sovereign rights’ as a justification for murder and mayhem and using the world body as a cover. Citing such current examples as Syria’s brutal suppression of its own people, the ongoing genocide taking place in Somalia and China’s ongoing repression and suppression of both its own people as well as the people of Tibet, Wajsman told his audience that they too would have to take a stand against the UN’s complacent, compliant and sometimes complicit political leadership which can no longer do anything but tolerate lies while millions die and democracies demonized. And he directly linked the Arab world's ability to get away with attacks on one of the UN's few democracies, Israel, on its oil power and the common thread of hatred of the "other" as an essential tool to maintaining the power of despots and dictators not only over their own people but over the direction of the world body. “An informational currency based on hatred, falsehood and arrogance, is devoid of any moral or legal value,” said Wajsman. "The new currency of international relations must not be, to paraphrase Martin Luther King, Jr., a cheque drawn on the moral capital of mankind that is returned for insufficient funds,” said Wajsman. “It is your challenge, and responsibility, as future leaders , to ensure that the world bank of morality is never leveraged, nor compromised, to the threats of tyrants or the cowardice of moral relativism. " The two rows of ribbons stitched on Cadet Russ Boston’s uniform had a lot to say about the time he spent as a fighting soldier during America’s recent conflict in Iraq. The former Marine is presently studying at the U.S. Army’s elite West Point Military Academy,When asked about Wajsman’s address, Boston said he was more than impressed by what Wajsman had to say about international relations in the age of instant communication. “He had a lot to say,” said the young cadet,”…and he left us with a lot to think about." Many in the audience agreed that Wajsman’s speech was both a warning and an inspiration. Over its four days the Conference grappled with such substantive global issues as media strategy, Afghanistan, the joint crisis in Libya, and the Ladakh Summit,, human rights, racism, genomics and biotechnology.